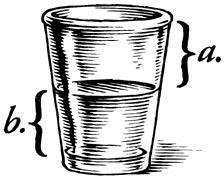 We all know the analogy about the half-full glass—or is it half-empty? Well there’s a dark and a troubled side of life. However, I think the difference between half-empty and half-full is more than simply keeping a positive attitude, or looking at the sunny side. I think it has to do with being thankful—or not. We live in a culture which is increasingly focused on what we don’t have, and on the importance of equality as being defined as having what everyone else has. The goal of advertising, politics, and even entertainment is to tell what what we don’t have, and to make us believe that we need something that only someone else can give us. As the Colonel on MASH used to say, it’s horse-hockey. The Bible tells us we have been given all things pertaining to life and godliness (2 Peter 1:3). We have enough, and that’s a lot to be thankful for. Of course, if you want something other than that, you’re on your own. Being thankful for what is in your glass—or even that you have a glass in the first place—is a choice. It requires adjusting your focus. There is “a dark and troubled side to life,” and we shouldn’t pretend it doesn’t exist. However, there is also a sunny side. When you keep on the sunny side by focusing and being thankful for what you’ve been given, you can still see the dark side, but it never looks quite as bad. This entry was posted on Thursday, November 24th, 2011 at 12:33 pmand is filed under . You can follow any responses to this entry through the RSS 2.0 feed. You can leave a response, or trackback from your own site. I’ll try and do that a bit more.